Very happy with purchase. Good product, quick delivery. A pre delivery call would have been nice. Great service. Item was exactly what I needed. When you travel don"t leave your beloved pet behind. Take your cat or dog with you and let him enjoy the comfort of our safe and sturdy pet carrier! Our durable pet luggage carrier is generous in size and provides the optimum in comfort and safety for your pet. No one needs one more thing to worry about while traveling. Our top-of-the-line pet carrier will relieve you of any concerns about the safety or comfort of your pet. You will not be burdened with a bulky carrier that is difficult to move about. 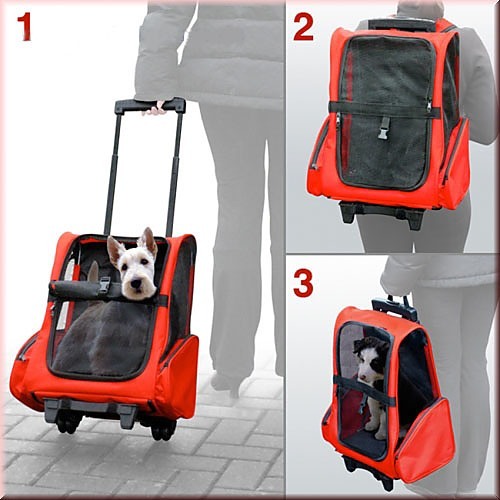 Our pet carrier is easy to pull and allows you maximum mobility no matter where you travel. The telescopic handle is adjustable for the comfort of human handlers. The carrier is fitted with mesh panels that keep your pet cool and adequately ventilated. Its generous size accommodates pets of a full-range of heights and weights. The strong and durable fabric is stain resistant and easy to clean after travel. The carrier folds flat for convenient storage and the padded backpack straps tuck away when not in use. The safety features of this top-notch carrier include an inner safety strap that can clip onto your pet"s collar. The access panel is wide allowing for easy access for pets of any size. Two zippered storage compartments provide for the convenient and secure storage of your pet"s leash and other accessories. Order our first-class pet luggage carrier today! Make your travel worry-free and allow your pet to travel in comfort and safety. Received order promptly and in good condition. Trolley great value for money very sturdy. Keep your puppy’s accidents to a minimum while you speed up his housebreaking! Provide your dog with access to a pet toilet alternative with this handy indoor dog grass training pad. Your dog will quickly learn that it’s okay to use the pad when you’re not home. The pad will keep your house clean.. This 2 Piece Dog Agility Training Combo Set adds variety to your dog's training or exercise routine. Featuring Tyre Jump and a pet exercise tunnel this combo set provides pet with physical and mental stimulation. It helps increase obedience levels and most importantly, it's a great way to have fun w..
Do you hear mice or rats scurrying around your home when all else is quiet? Have you been finding chewed up corners on your furniture or nibbled items in your kitchen cupboards? The signs of rats or mice in your house are very disturbing! The Multi-Catch Trap will put an immediate end to your proble..